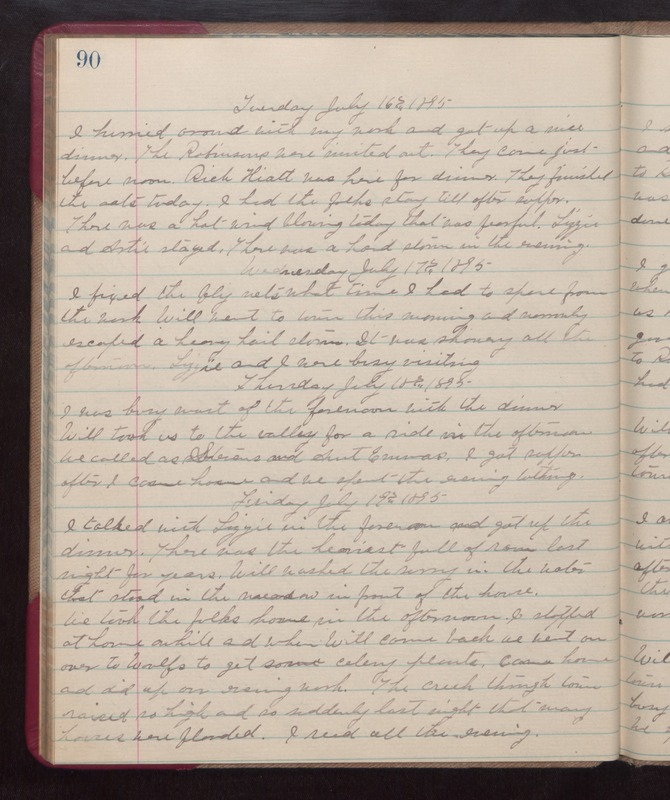 Tuesday July 16th 1895 I hurried around with my work and got up a nice dinner. The Robinsons were invited out. They came just before noon. Rich Hiatt was here for dinner. They finished the oats today. I had the folks stay till after supper. There was a hot wind blowing today that was powerful. Lizzie and Artie stayed. There was a hard storm in the evening. Wednesday July 17th 1895 I fixed the fly nets what time I had to spare from the work. Will went to town this morning and narrowly escaped a heavy hail storm. It was showery all the afternoon. Lizzie and I were busy visiting. Thursday July 18th 1895 I was busy most of the forenoon with the dinner Will took us to the valley for a ride in the afternoon. We called as Stevens and Aunt Emmas. I got supper after I came home and we spent the evening talking. Friday July 19th 1895 I talked with Lizzie in the forenoon and got up the dinner. There was the heaviest fall of rain last night for years. Will washed the surrey in the water that stood in the meadow in front of the house. We took the folks home in the afternoon. I stopped over to Woolfs to get some celery plants. Came home and did up our evening work. The creek through town raised so high and so suddenly last night that many houses were flooded. I read all the evening.